As I have mentioned many times before, loom beading usually requires the beader to deal with warp ends. This is a tedious affair especially with wider bracelets. Beadwork designer Deb Moffett-Hall's new Endless Loom which lets you off the work is now out. It will take a while before suppliers stock it. 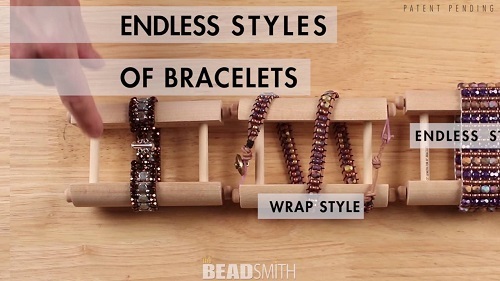 But here is a quick look at the innovative design from the folks at Beadsmith. The loom can make different bracelet sizes depending on which of the special dowel lengths you use. You are also not limited to just traditional loom beadwork. Use it for the strapped cord style bracelets or even elasticated ones too. What I like about it is how small and portable it is. Want to see it in action? Also check out this video tutorial by Patterns to Bead as she demonstrates how to set up and warp the loom and begin weaving with two-hole honey comb beads. It can be a bit fiddly as you do have to use easement bars to allow space for the beads to come. So listen to her tips! I will certainly wait and see what sort of delicious tutorials beaders come up with! In the meantime, I have my other looms. My favorite is the inexpensive, easy to use, portable Jewel Loom - see book review below. I saw this loom demonstrated in Tucson last February. I've been waiting for it to be sold retail. The thing I liked about it was that it could be used with elastic for stretchy bracelets. Pearl - sigh - I - just - ordered the bangle weaver tool. I - can't - order something else immediately. I just can't. Arghhh!!! How do you start/finish the stretch bracelet with no clasp? I bought this loom yesterday and am excited to use it! All of the tutorials are for using a clasp, how do you use the loom if you do not want to use a connector?